These snow white birds are truly spectacular. Recently, several states have started a restoration program to increase populations for these graceful birds. Now you can introduce a pair to your yard! Each bird is made from 5 layers which, when glued together, give a realistic 3-dimensional look. Pieces can be cut from standard "2x12" stock and some 3/4" stock. No edge gluing required. All patterns for both projects are drawn FULL SIZE. 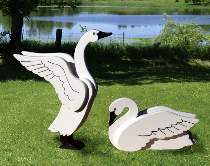 Standing swan measures 36-3/4"H x 31"L. Sitting swan measures 16"H x 27"L. Order two black rounds for the eyes and two 1/4" fiberglass mounting rods for each bird separately.